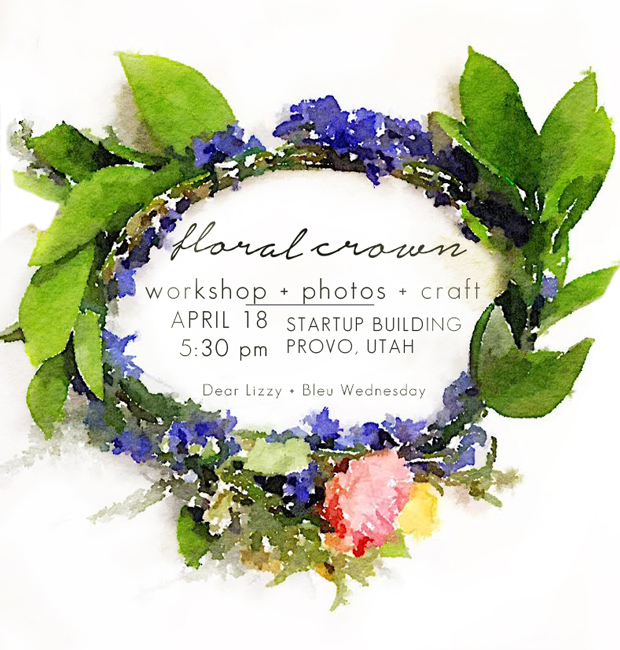 I am excited to announce that Dear Lizzy's Liz has invited me to team up with her for a Floral Crown Workshop for you next month! Picture turning bright spring blooms into a gorgeous head piece. We'll also snap photos and make a tag to remember the fun night! It’s the girls’ night out you've been needing so badly! Come and get your craft on with us! When: FRIDAY, APRIL 18th at 5:30 pm in Provo, Utah. We will have everything perfectly packaged there for you including all the tools you’ll need. Plus, treats and drinks of course! So bring your cute self… Invite your sister, mother, girlfriend, and daughter too for a much needed girls’ night! **The cost is just $35 per kit. If it’s a mother/daughter duo, 2 kits for $55. After the crowns are finished we will take professional photos and have some supplies to make a tag to take home to remember this magical night! Space and supplies are limited so reserve your spot. **we got some sponsors so there’s a lower price!